Spreadable rhubarb-curd is nice to have around as a tart tasting topping adding to whatever you have chosen to put it on. What is the definition of curd? We hear of milk curd and cheese curds all the time. The best way to describe curd is to say it is simply the solid leftover after having been combined with an acidic or a sour type ingredient, and then draining the excess liquid from the solid material that formed. These are "curds" that are left behind and used in various ways. The solid substance formed when milk turns sour for example, is used in making cheese. There are fruit curds too. You have probably seen any number including apple and raspberry. These curds are basically made the same way and usually thicker than a custard. Lemon curd is probably the most popular as you can find an easy recipe to make lemon curd anywhere. 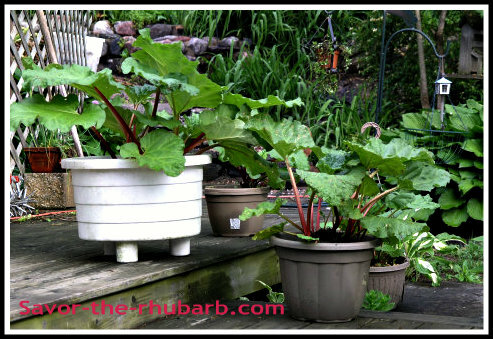 A rhubarb-curd is made by first taking a rhubarb puree, straining it as much as possible through a cheesecloth or sieve of some kind, and then taking the strained mixture and combining it with ingredients including eggs, butter, and citrus as in the video. Some use a double boiler process, some don't. When you know how to make curd, you will have a heavier spread that goes with anything you like. It's delicious on small tarts, toast for breakfast, most any pastries, crumpets, scones and English muffins toasted or plain. 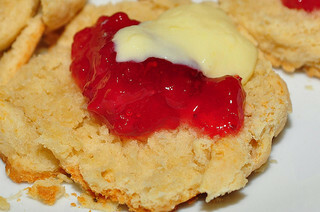 If you would like to make rhubarb-curd for shortbread, this is an easy recipe to follow. It starts off like making a regular compote. 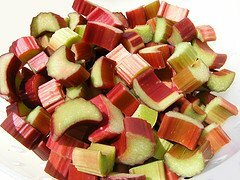 Mix well, and cook for 12 - 15 minutes until the rhubarb breaks down. Stir to avoid it sticking to bottom. Take the pot off the stove and continue the puree process with a hand-blender. 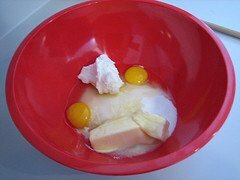 Strain the mixture into another bowl. Set this aside as you start the double boiler process. As the puree sits, start a double boiler with just a few inches of water in the bottom saucepan on medium heat. As the water heats, combine the following in the second bowl that will be the upper half of the double boiler. Whisk well to make sure all is combined equally and the sugar is dissolved. Add the rhubarb mixture in very slowly, just a spoonful at a time. Now place the upper bowl over the hot water pot and the curd will thicken while you whisk for at least 5 minutes. 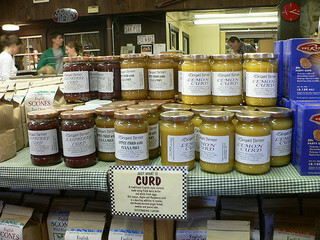 Rhubarb curd is made simply by thickening a puree with eggs and butter to a heavy jam-like consistency. It's a lovely British tradition which is then kept in jars that will keep for up to a week refrigerated. Want your rhubarb-curd prettier for presentation? Add a bit of grenadine or red food coloring. Just add a drop as these are concentrated and just a dash goes a very long way.